Got a music-loving middle-schooler? Make ’em happy by downloading My Note Games, today’s Free App of the Day. AS FEATURED ON BBC CLICK! NOMINATED FOR A ‘LEARNING WITHOUT FRONTIERS’ INNOVATION AWARD 2012! This app listens to you playing your instrument! Watch the notes fly off the screen when you play them correctly! ‘My Note Games!’ comprises a suite of simple games to teach music theory and instrument mastery. All games are free to try. You can upgrade to the premium versions within the app. Games can be purchased individually or in bundles. Music practice will never be the same! ✰ HEAR IT, NOTE IT! Write what you hear using our simple drag-and-drop interface. Tap on the buttons to name the notes. 48 levels each for Treble, Bass, Tenor and Alto Clefs. The first 4 notes of each clef are free. The Premium version includes all the rest. Recognises the notes you play on your instrument*. Unlock 18 levels and master your first Octave. How well can you play the whole octave in-tune? The first 3 notes of all instruments are free. The Premium version includes the rest of the notes for ALL instruments PLUS ‘Tap That Note’. Choose a lesson to play with your instrument**. Play the eight phrases and get the best score you can. Come back the next day and try and beat your score. See how your sight reading has improved over the last month. Lessons: Crotchets, Minims, 3/4 Time, Quavers, Various Key Signatures. ‘Play-A-Day!’ uses an almost limitless supply of computer generated phrases. The Crotchets lessons are free. The Premium version includes the rest of the lessons for ALL instruments. Play, sing and whistle carols. Get a score for accuracy. Try and beat it tomorrow. See the note you are playing displayed on the screen. Watch what happens to Toonr as you play higher and lower notes. Use Toonr to tune your Guitar or even tune MyNoteGames to your out-of-tune Piano. * Instruments supported by ‘Play That Note!’: Saxophone, Piano, Guitar, Recorders, Woodwind, Bb Trumpet, Violin, Viola, Cello, Vocals and Whistling. ** Instruments supported by ‘Play-A-Day!’: Saxophone, Piano, Guitar, Descant/Soprano Recorder, Treble Recorder, Flute, Oboe, Clarinet, Bassoon, Trumpet, Vocals and Whistling. 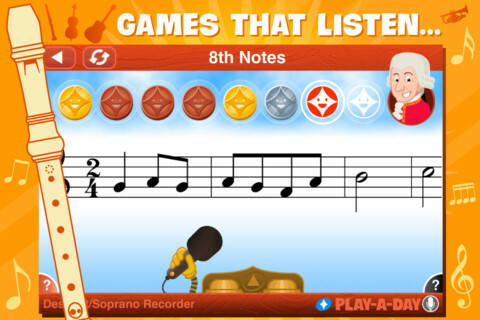 Designed to be used under the supervision of a parent or music teacher, ‘My Note Games!’ uses note recognition technology.